To sell either new or used vehicles in New Jersey, you will need to get a dealer license from the New Jersey Motor Vehicle Commission. 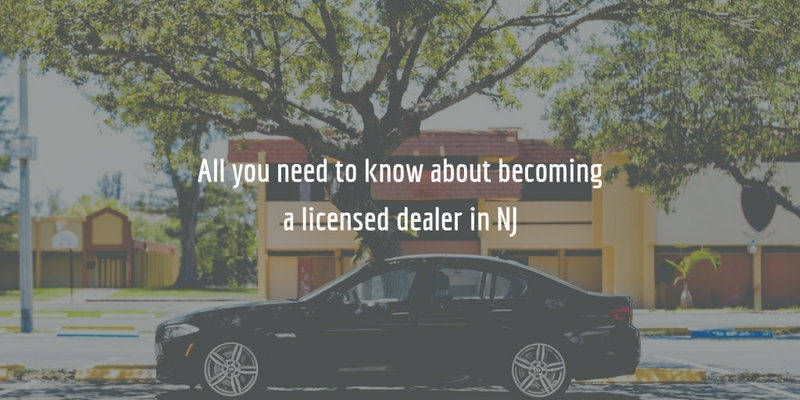 The licensing process for dealer license applicants in New Jersey is fairly straightforward. You will need to complete and submit the application forms, pay the respective fees, and once you are pre-approved, provide insurance and a New Jersey auto dealer bond. For a detailed breakdown of the licensing process, read on! Once you have covered the qualification criteria, you can proceed with downloading, completing and submitting your dealer license application form. Used and new car dealers go through the same license application process. Begin by downloading the application form. The form includes further instructions and a checklist to help you keep track of the required documentation, so make sure to review the whole document. As soon as your application has been received and reviewed by the Commission, you can expect to receive a preliminary license approval. Upon receiving approval you will need to obtain an insurance certificate and a surety bond in order to complete your application. The NJ MVC-Dealer Unit must be listed as the certificate holder of the liability insurance. The auto dealer bond you need to obtain from a surety bond agency needs to be in the amount of $10,000. Read more about the bond requirement in the section below! Finally, in order to complete the application process, you will need to pay a $100 license fee and a $257.50 registration fee. As soon as you submit these last two items and pay all applicable fees, you can expect to receive your dealer license from the Commission by mail. NJ dealer licenses are valid for one year and expire on March 31 every year. The Motor Vehicle Commission mails renewal papers to license holders about 60 days prior to the expiration date. Note that when renewing your license, you will also need to renew your bond. The $10,000 amount of the dealer bond is not the same as the cost of the bond! The cost of your bond is a fraction of the full amount and depends on your credit score (most importantly) as well as on your financial statements and other financial information you provide the surety with. Typically, applicants who have a high credit score are provided with a low rate on their bond, sometimes as low as 1% of the total amount. To get an exact quote on your bond, simply complete and submit our surety bond application form, and we will contact you with a FREE quote along with further instructions how to finalize your bond application. If you have any additional questions, call us at 877.514.5146 or contact us by email! Ready to apply for your auto dealer bond? Start by getting a FREE quote!